My first visit with artists Anna Townley and Lawrence Bradby was at their home, followed by a visit to their workspace at Outpost studio’s with Anna. Referencing their extended research project ‘artists as parents as artists’ I am seeking to explore ‘home as studio as home’ and how this connects to their external studio space. My conversation is predominately with Anna with Lawrence joining us later. Townley and Bradby’s recent project shown at the Minories in Colchester Everything, All at once, All the time, explored what they coin as the ‘the exploded studio’. A term they use “to describe how their practice occupies small periods of the domestic routine, sharing thinking space and living space on equal terms with cooking, washing, cleaning, parenting” (1). The exhibition presented film, drawings, activities, discussion, performance and events to communicate their findings from an investigation into the relationship between art making and family life. When asking Anna if they have ever viewed their home as a studio she talks of an upstairs bedroom window ledge that was once her studio space, Anna tells me, “I drew the view from the window, it was the beginning of the work, a bit everyday”. Dovetailing creative activity with the repetition of domestic tasks and the activities of a family home is a skillful activity. To claim a part of any shared home for oneself can be a difficult endeavor to secure. What then does the separate studio space facilitate? Their studio at Outpost is one of a series of booths in a former open plan office. Sometimes the children come to the space, sometimes Anna and Lawrence visit together, sometimes separately. It has no radio, no internet, no music and if no-one else is using the space, no conversation either. 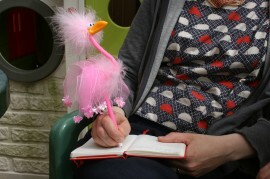 Anna describes the significance of having a period of time when she is not talking but drawing, in silence. This is the striking juxtaposition to the home environment where the family of 5 interact, live, laugh, argue, play, eat and sleep. The studio signifies and amplifies silence. There are limited domestic interruptions, no washing up to do and no clothes to hang on the line. Essentially it offers a refuge from the intensity of their subject matter, a place to take a step back. It is this removal albeit temporarily from the context of domestic and daily life that defines their work as art practice and not just a family who are creative. The Boyle Family used “wherever they lived as their studio” and as an extension of that “family and friends were co-oped to help whenever there was a big show going off and an event to put on” (2). When art making and art thinking happen within a domestic space perhaps it is inevitable that it becomes a co-authored process. How can a discussion be separated into a series of single person credits? To do so would go against the purpose of discussion itself, a collaborative and at its best an open act where the unpredictability of topics and ideas expressed is welcomed. The Boyle children were always part of the studio, engaged in expeditions, working trips and hanging exhibitions. Later they opted to remain part of this family art making team (3). They continue to work under the Boyle Family authorship but are distinctly different to Townley and Bradby. The Boyle Family create work which is predominately outward looking, geography, geology, biology. It would be overly simplistic to say that Townley and Bradby were solely inward looking. Their exploration of the everyday connects to what Ben Highmore describes as “the potential ability of producing, not difference, but commonality”(4). In his book The Everyday Reader, Highmore quotes Lefeovre, who considered the everyday extensively “everyday life is profoundly related to all activities, and encompasses them with all their differences and their conflicts (5). By focusing on the everyday the work has a universality which enables it to travel beyond the specifically personal and introspective. Initially this artistic duo worked without a studio, money was set aside to support meetings in cafes because “we have meetings and talk a lot”. Now they have the studio this can be the location for meetings “its different from home more central, more neutral space and means we don’t have to bring people into our domestic lives”. This is interesting as Townley and Bradby’s work is all about showing domestic lives and activities, albeit in an edited and considered manner. The studio affords them the choice, conversations may take place around the kitchen table or at the studio. The choice of location would I imagine depend on the nature of the discussion and the people involved. There are some activities which are undertaken at home, email correspondence (although drafts may be composed in the studio) and editing of film footage. 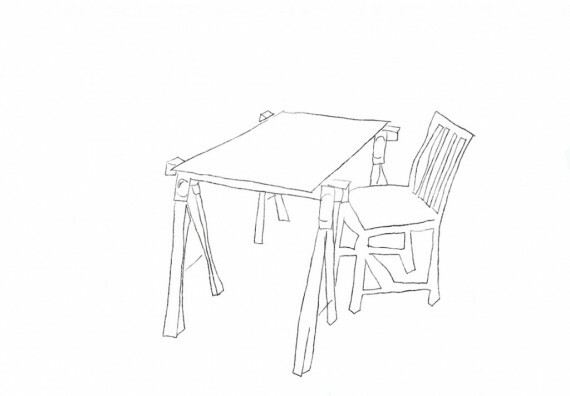 Anna also has drawing kits around the house facilitating the Daily Observation Series (2011 – present) where small objects and children’s ensembles can be recorded before they are dismantled and reconfigured in the days that follow. These simple packs of paper and drawing implements Anna call Micro Studios are prepared so she is ready to take advantage of opportunities to draw during the day. Sometimes Lawrence works on his own projects and has recently started a reading group, focused on discussing critical texts which have been selected by the group. 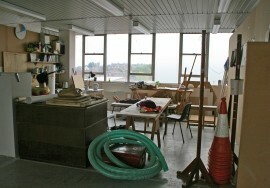 The studio has been the venue for one of the gatherings. Lawrence also uses the studio as a valuable opportunity to spread out information provided by artists commissioning his writing. He is able to lay notes and ideas out in the space to aid planning. Having this space to stretch out is important and contrasts with his alternative work space referred to as the McOffice – which may be the local McDonald or another cafe, the only prerequisite being a free wireless connection so he can work. Lawrence describes their work as “an anthropological activity, gathering data about the creativity happening at home”, Anna adds “we use home in a different way (to the studio), involving people and the children”. They go on to describe how by moving away from what they are immersed in, they can understand more. Establishing distance underpins reflection. 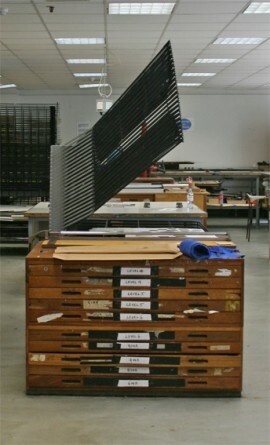 The work has to be formed, shaped and considered in terms of how to show the work to an audience and some of this processes is supported by the studio. When Anna and I arrive at the Outpost studios she takes time to show me some of the other occupied floors of this former office block. The variety of work that can openly be seen is somewhat overwhelming. I can imagine myself wandering around for hours, looking into spaces in a distracted state, forgetting why I was there or what my own work was about. Familiarity likely overcomes this natural artistic compulsion to be nosy. 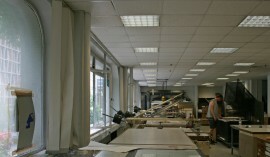 Townley and Bradby’s space is large with windows that flood the space with light. Anna repeatedly calls the studio a dumping ground but I find it far from this. There is order and interest, much interest with plenty of objects with potential, to be made into artworks or used in workshops. One side of the space even has a limited colour palette; wooden table, easel, cardboard, unpainted constructed walls. Visually it is very easy on the eye, not far removed from something engineered for an interiors magazine. Importantly though this is not a display space it is a place of work. Some old work is stored here, but also new materials lay in wait. Anna shows me a box of small packaging boxes, the intended purpose yet unknown. They, like much of Townley and Bradby’s work, tell of personal family stories of pain relief and head lice treatment, of tooth cleaning and the application of luxury skin preparations. I have long been fascinated by the notion of studio as luxury item, cherished but used in small doses, uneconomical and impractical on many levels but nevertheless desired. For these artists home is both site and subject matter. The external studio provides an essential separation from the intensity of working in this way and a space to be in silence.